The commercial success of film Baahubali: The Beginning (or Simply Baahubali) resulted into multiple stuffs. The movie was followed by even more successful sequel Baahubali: The Conclusion. Official game named Baahuali: The game (Official) is launched. There are many unofficial merchandises might have started selling. And more to this is a book series started. S S Rajamouli, the man behind the Baahubali franchisee have thought that it is worth to explore the tale of Baahubali on the canvas of book. Impressed by the earlier works of Anand Neelakantan, he have invited him to give a free way to his thoughts and imagine the possible events happened in the past, which took us the events shown in the Baahubali films. 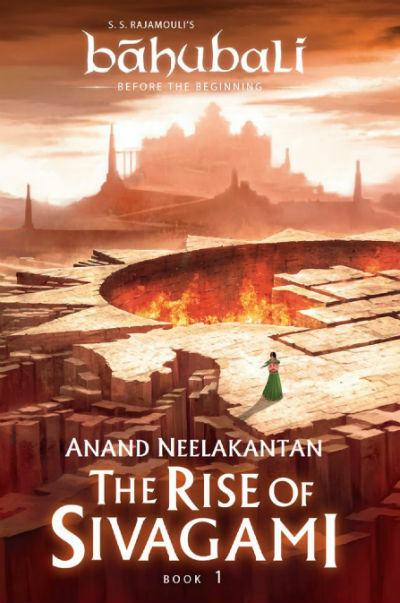 And it was resulted into the first book in the series The Rise of Sivagami: Book 1 of Baahubali – Before the Beginning. The book was officially launched a few weeks before the second movie in the series (Baahubali: The Conclusion) was released. I found the free content quite impressive and decided to read the entire book. I have completed reading the book a few weeks ago and here are my personal views and reviews for the same. The book cover is attractive and it reflects the spirit of the book. I will try to avoid spoilers and not reveal the major important incidents, but it is possible to have a few. Here is the bird’s eye view to the plot. Sivagami is a promising young girl living with Thimma who treats her no less than his own daughter. She is fearless and decisive. Thimma is a Bhoomipathi in the kingdom of Mahishmati ruled by Maharaja Somadeva. Sivagami’s father Devaraya was also a Bhoomipathi in the same kingdom and was a good friend of Thimma. Actually, on occasion in past, Devaraya was considered (and declared) traitor by the king and his aide and was sentenced to death. Sivagami could not digest the incident and have developed a grudge against Mahishmati and it’s rules and decided to avenge them. One day she breaks into her home (now sealed by the authorities) and grab a book which his father have asked her to find all answers in. On a fateful day Thimma takes Sivagami to Parameshwara and king Somadeva and request them to let her live in the Royal orphanage. Eventually king agree to it but it broke Sivagami from inside. Thimma consoled her that one day she will understand why he is doing this, as he loves her a lot. The life at royal orphanage was nothing less than a hell for Sivagami. We eventually learn that the lady in charge was doing a lot of wrong things there. Sivagami have found two friends in Kamakshi and Gundu Ramu and at the same time a lot of enemies too. Kattappa and Shivappa are two brothers whose father Malayappa is a slave to the king. He consider being the shadow of the king a matter of joy and respect. He want his two sons to be the same. The younger son Shivappa was quite a rebel and considered slavery as a bane. He loved Kamakshi and to ensure a better future with her, one day he runs away and considered as dead by many. Kattappa, for his bravery was appointed as the slave confidante and bodyguard of BijjalaDeva, the elder son of Maharaja Somadeva. BijjalaDeva was not only foul mouth and headstrong but have no respect for anyone who is working for him or his kingdom. His younger brother prince Mahadeva was kind-heart and soft in nature. He is a genuine human being and he doesn’t like injustice to be happened to anyone and was bullied by Bijjala often for that. Though in one incident he shows such a bravery that he was given the name Vikramadeva. There are genuine officers like Skandadasa who rise from the life of orphan to the Mahapradhana of Mahishmati and there are people like Keki, Jeemotha, Pattaraya, Kalika, Hidumba and others who are having their own intentions and goals. There is a track of Bhutaraya who is the leader of Vaithalikas and there is Achi Nagamma. They have their own reasons to have the rulers of Mahishmati fall. What are their reasons? How all these tracks are meeting each other? And many more questions are answered (and many more raised) in the sad ending of the book. Anand Neelakantan is highly influenced by Mahabharata and Ramayana like majority of other Indians, his ability to view the perspective from different angles lets him explore the things in interesting manner. When he started writing this book he have already have the basics about a few characters and how they should shape. For example, Sivagami, Kattappa, BijjalaDeva and some others. The incidents and background of them is for him to imagine along with the other characters. In terms of imagining and exploring the characters, I think he have done a nice job. In terms of pace, the book’s first part starts with something quite interesting, around the middle part, it goes to the different arena, and towards climax it picks the pace. The end makes you await for the next part interestingly without a doubt. At the same time, the fate, the few characters met with will make you sad. In terms of writing he is good at many places. Though when explored the incidents at Kalika’s den or involving Bijjala and Jeemotha, the things moved in adult zone. Some incidents makes the characters look disgusting and pathetic, and that is in one way is triumph of the author in terms of exploring characters. but there are certain duties that cannot be left to assistants, however smart they may be. We are a race that gains wisdom only after disaster strikes us. For us, security is an inconvenience. Child, even an old father like me will find strength to do anything if he has to save his children. They are cowards who act brave because we allow them to. They act important because we, in our minds, think we are inferior. Just because the colour of our skin is black and they are a shade fairer. Future? Do slaves have a future, Anna? We collect so many things when we are young, and when we reach a certain age, we understand most of them were worthless. Despite the best plans, he knew that in politics things could change at any moment – loyalties flipped often, backstabbing was the norm, and ethics were a matter of lip service. Getting old forced one to be spiritual, he thought. When eyes fail to see, ears have to become eyes. Rules are often cruel but necessary, daughter. You can change a system only by being part of that system, by being part of the change. The rainbow parted as the slave fell, as if afraid of touching his black body. Everyone judges others by their own standard. As you can see clearly that there some good philosophical lines weaved in the book nicely. And at the same time some straight forward punches are also there. The language is quite normal. The author took care to not to add too much of linguistic attributes (however there are a few) so readers can enjoy the book. The books have a few spelling mistakes in last few chapters (like missing of a space between two words). Having “Dramatis Personae” in the beginning of the book (part of the free content too) makes it easy for readers to understand the character and catch the details of incidents quite easily. It would be difficult otherwise as there are many characters involved in this long book which is explored over 51 chapters. We suggest you to give a read to acknowledgements and preface as well. The book is not a masterpiece. But, it is definitely a book worth reading without a doubt. When available for somewhere between INR 150-200 (in a scheme) it is a good buy. Definitely much better than some crap available in the market today which got commercial success for no reason. Our rating: 7 – 7.5 stars out of 10.